This helpful how-to manual provides you with all the know-how you need to plan and conduct a parent/child workshop in your library--and develop a useful parenting collection that child and family-related agencies will take advantage of. You'll learn all the basics for designing a program that will meet your library's particular needs, from creating the right setting to a list of recommended materials, examples of forms, figuring out staffing needs and roles, program structure, and an overview of costs. As an added bonus, appendixes describing support collections, a distributors' directory, and a bibliography of professional literature are included. About Kathleen Deere (Author) : Kathleen Deere is a published author. 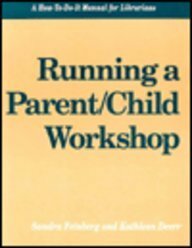 A published credit of Kathleen Deere is Running a Parent/Child Workshop: A How-To-Do-It Manual for Librarians (How-to-Do-It Manual, 46). About Middle Country pub (Author) : Middle Country pub is a published author. A published credit of Middle Country pub is Running a Parent/Child Workshop: A How-To-Do-It Manual for Librarians (How-to-Do-It Manual, 46).